I read with sorrow that Don Knotts, the Ralph Furley to Three's Company, the Barney Fife to the Andy Griffith Show, has died at 81. Don Knotts career spanned 60 years and started before I was born. Our thoughts go out to him and his family. The LA Times has an obituary saying "longtime friend Griffith was one of his last visitors on Friday night." I haven't found any quotes yet from the Three's Company cast and crew. The official Don Knotts web site has a guestbook to share your sentiments. With the final season of Three's Company on DVD getting close, I hope they will include a tribute to Don and all of the cast who is no longer with us. A final time capsule of the show and its cast, 30 years after the show's premiere. Lots has happened in the world of Three's Company since I last updated my page. Several cast members have passed on. Norman Fell (Stanley Roper) and Audrey Lindley (Helen Roper) have left us. And, tragically, John Ritter (Jack Tripper) died of an undiagnosed heart ailment September 11th, 2003 on the set of "8 Simple Rules for Dating My Teenage Daughter." He was only 54 years old. The date is eerie for a few reasons. First, and most apparent, is his death coincided with the second anniversary of the 9/11 terrorist attacks. Second, is that his 55th birthday was only 6 days away, September 17th. Third, September 11th is the birthday of one of his daughters, Stella Ritter, who was only 5 years old at the time. John Ritter will be dearly missed not just by Three's Company fans, but by all of the people whose lives he touched. Speaking of 8 Simple Rules, this series came to life since my last update and has been a modest success. It continued two years after the loss of its start John Ritter. The final season has just completed and ABC announced on May 17th, 2005 that it will not be returning next season. And finally, to the joy of Three's Company fans everywhere, the Three's Company series is available on DVD! As of this writing, Season 5 is due out in one month. I have created a guide to track the progress of the release of the DVD seasons. They have been releasing one DVD season about every six months. I will maintain estimates of when upcoming DVD seasons will be released in the Three's Company DVD section. Well, I think we're up to date on Three's Company news. If I missed anything, just let me know, I love to hear from other Three's Company fans. See you next update! Where the Three's Company fun begins. Get synopsis, guest stars, air date and more info on each Three's Company episode in the series. Even includes the spin-offs "The Ropers" and "Three's a Crowd." A collection of Three's Company sound clips hand-picked by yours' truly. Even a random sound clip player, in case you can't decide. A good part of John Ritter's (Jack Tripper's) physical comedy includes quips and outbursts. Hear some of the sounds jack makes. Three's Company is on DVD. There is a book on Three's Company and all of the stars have movies and other TV series. Track the progress of the release of the Three's Company seasons on DVD and see what the stars of the show have to offer on the DVDs, Books and More page. There are a whole host of other Three's Company sites on the web. A few have been around longer than my site! See the comprehensive list. This guide has the episodes is the order they were originally aired. This guide has the episodes in the order of their production codes. Note: This would play automatically when the page loaded if you were running Netscape Navigator 3.0 or greater or Microsoft Internet Explorer 3.0 or greater. 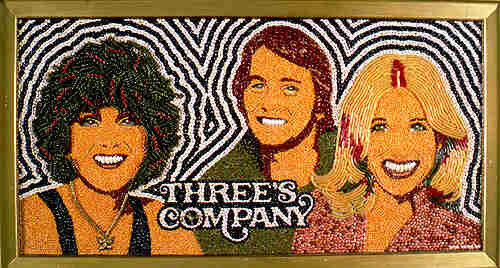 "THREE'S COMPANY" is a registered trademark. That mark and the content of the "Three's Company" television series are owned by Three's Company, a California joint venture, which is not connected with this site.